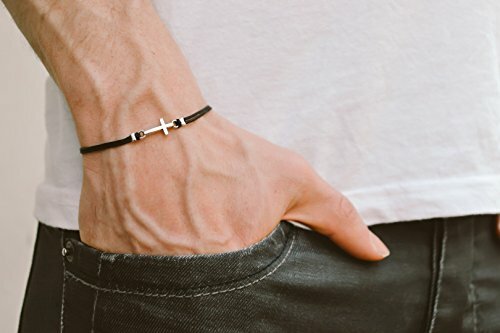 Cross bracelet for men - cord bracelet with a antique silver cross charm. The cords are black and made of waxed cotton and the charm is s zinc alloy metal. Closure: clasp. You can request a different cord color from the colors shown in the last picture. Cord material: waxed cotton Charm material: zinc alloy metal (silver tone) Length: The bracelet is 7 1/2 inch long. If you would like a different length Select the size you would like from the options below. This necklace is great as a gift for a man or a boy. All of our jewelry comes wrapped and ready for gift giving!